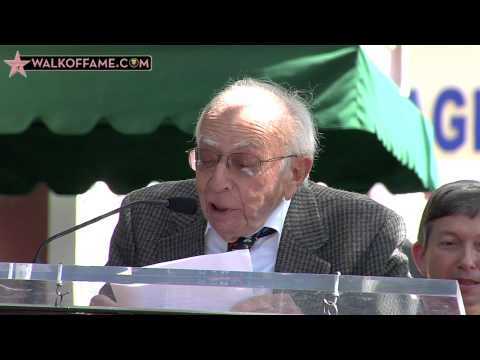 Sherwood Schwartz was honored with the 2,356th star on the Hollywood Walk of Fame. Hollywood Chamber of Commerce President and CEO, Leron Gubler, presided over the ceremony. Guests included Florence Henderson and Dawn Wells. 6541 Hollywood Boulevard on March 7, 2008. Sherwood Schwartz started writing professionally on "The Bob Hope Radio Show" in 1939. After four years with Bob Hope, Sherwood joined the Armed Forces Radio Service (A.F.R.S.) for four years, writing various Army shows like "Command Performance," "Mail Call," etc., working with just about every major star in the entertainment world. After the war, he went back to radio and "The Adventures of Ozzie and Harriet." In radio he has also written for Danny Thomas, Alan Young and "The Beulah Show." In his long career in TV (58 years), Sherwood Schwartz has written, re-written, and/or produced more than 700 TV shows, starting with "I Married Joan," "The Red Skelton Show," and "My Favorite Martian," before creating, writing, and producing series of his own. Sherwood received the highest honor in television, the Emmy Award, in 1961 for "The Red Skelton Show," and the following year, another Emmy nomination. His scripts have the unique distinction of receiving five consecutive nominations for awards from the Writers Guild of America in comedy, variety, and play adaptation, receiving the WGA award in the comedy category. In 1963, Sherwood created, wrote and produced "Gilligan's Island," a TV series which has become a cult classic. "Gilligan's Island" led to three two-hour TV movies. One of them, "Rescue from Gilligan's Island," was the first of the so-called "reunion shows" and was the highest rated movie-of-the-week in 1978. In 1969, Sherwood created, wrote and produced "The Brady Bunch," television's first blended family show. It, too, has become a cult classic, leading to several reunion shows. In 1988, Sherwood and his son Lloyd, wrote and produced a two-hour TV film, "A Very Brady Christmas," which was the highest rated TV film that year. In 1994, Sherwood and his son, Lloyd, produced the feature film, "The Brady Bunch Movie," for Paramount. On March 12, 2004, "Gilligan's Island" received the annual "Pop Culture" award from TV Land. That same week, Sherwood was awarded the prestigious William S. Paley Award with "A Salute to Sherwood Schwartz." In 2007, "The Brady Bunch" was also awarded TV Land's "Pop Culture" award. That same year, along with his son, Lloyd, and his daughter, Hope Juber, Sherwood produced "Still Brady After All These Years: A Thirty-Five Year Anniversary Special" which won a daytime Emmy Nomination. In addition to TV and films, Sherwood has written several produced plays. Among them, "Mr. and Mrs.," a comedy; "The Trial of Othello," a courtroom drama; "Gilligan's Island: The Musical," (with his son, Lloyd with music and lyrics by his daughter, Hope, and her husband, Laurence Juber.) His latest play, "Rockers," a comedy-drama had a production last year at Theatre West. This June, a new musical "A Very Brady Musical" with music and lyrics by Hope and Laurence Juber will have its world premiere at Theatre West. Sherwood Schwartz co-wrote the theme song for "Gilligan's Island" with George Wyle and co-wrote the themes song for "The Brady Bunch" with Frank DeVol. Sherwood is a member of the Writers Guild of America, the Dramatists Guild and A.S.C.A.P, the American Society of Composers, Authors, and Publishers.